Those of us who create, often have a strong desire to. We didn’t start making bags, jewelry or scarves because handmade became trendy; we started because it excites us. 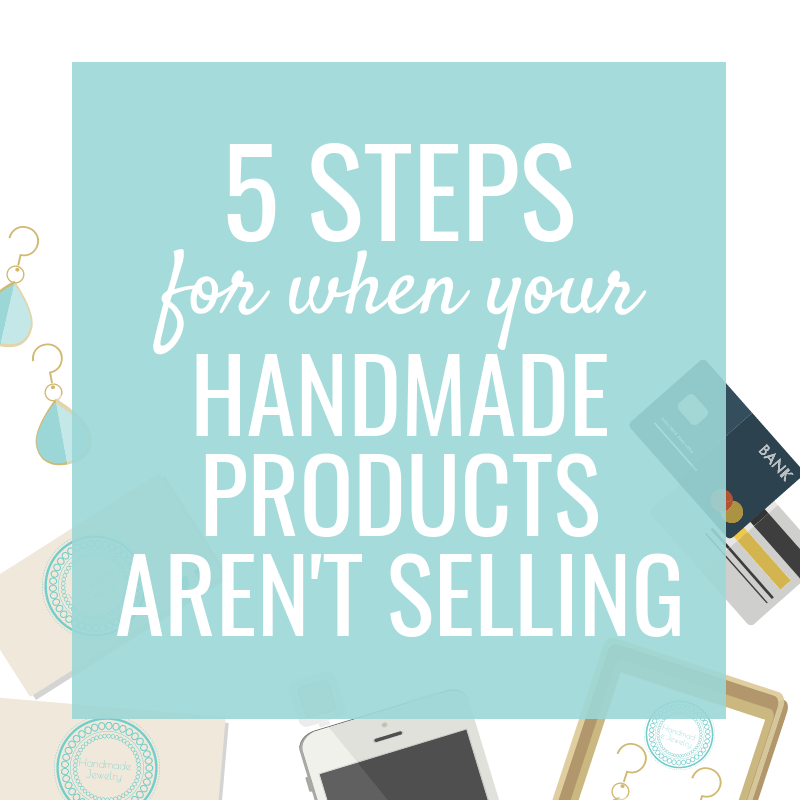 But what do you do when your handmade products aren’t selling? It’s hard when your passion and hard work isn’t validated through sales. The craft room starts getting crammed with piles of un-sold inventory and un-used materials. You need to sell some stock to make room for more creations, justify buying new materials and cover some expenses. And when you desperately want your craft to pay the bills, it’s even more frustrating when your products aren’t selling. Sales aren’t just a nice to have; they’re a need to have. If what you’re currently doing isn’t bringing you the number of sales you’d like, you’ve gotta change what you’re doing. This article is to share ideas when your products aren’t selling; your work is reaching people but not getting much attention or sales. You’re a creative person; you can figure this lack of sales thing out. Apply your creativity to other areas of your business and be open to tweaking your creative style when it comes to your products. Dedicate yourself to uncovering why your products aren’t selling as is. Is it your products? The style, price or materials? Is it your marketing? The way you photograph, describe and share? Is it your selling? Where you sell your products or the methods you use to sell? There’s no shame in the game of switching things up. I have never started a business and had the right idea or product out of the gate. Success has always come when I’ve been willing to pivot, no matter how great I thought my original idea was. When I wasn’t willing to put the work in to adjust; those businesses failed. Even if you get your business model right from the start, the rules are always changing. Etsy is not what it was 2 – 3 years ago. Nor is Facebook or Instagram or Pinterest. There will always be obstacles thrown on our path but we can move past them if we’re willing to change our strategy. Do you want to keep doing what you’re doing and have sales stay as is? Or are you willing to accept the current plan isn’t working and be open to any and all changes (within reason)? Your first and most important mission when your products aren’t selling should be to gather feedback. 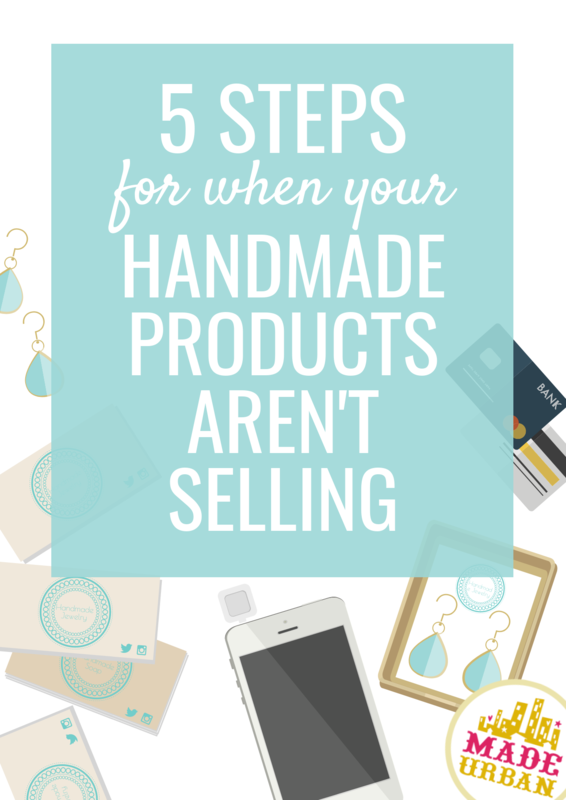 There’s no point shutting down your Etsy shop to build a new website, paying to promote listings or running Facebook ads if what you have just aint selling. We all have our unique talents and style but sometimes they need to be tweaked and developed to become more marketable. I know they’re the easiest people to turn to but don’t put them in that awkward position 😉 Not to mention, if they knew what was causing your low sales or wanted to share their critiques, they would have done so by now. Head to forums and ask for brutally honest feedback. That doesn’t give people permission to be rude but reassure them your feelings won’t be hurt if they share their honest opinions. What surrounds your products also has a big impact on how shoppers perceive your products, so get people to give their overall impression of your online shop. It may be that your product is awesome but your photography doesn’t do it justice. Or maybe your branding is throwing people off. Why do you believe people aren’t buying my product? If this were your shop, what’s one thing you would change? Is the photography sending the right message? I realize this can be a big expense but decide if it’s worth it for you. If you’re serious about turning your handmade business into a main source of income, spending the money on one on one time with a coach who has been-there-done-that could be just what you need. If you’re not in a position to hire a coach but could really use feedback from a professional, try reaching out to a business owner you admire or a craft show organizer. Get out of your comfort zone and gather a few names of people you may feel a little intimidated to approach. Try to choose people who are where you’d like to be in 5 years. Don’t expect everyone to say yes, or even answer your request (that’s why you want a few names). Be respectful of their time and send all information they need so if they’re feeling helpful and have time, they can look at your shop and answer specific questions regarding why your products aren’t selling. Include a link to your products and 1 – 3 questions you’d love to get their opinion on. This step is in no way to encourage you to copy someone else’s work or business. But you need to have an idea of the standards in your industry and for your product, which requires being aware of your competition. If you’re worried you might be tempted by a competitor’s ideas, research an industry, or product, similar to yours but that isn’t your competition. It will help you think outside the box and still give you a good idea of what the top shops are doing well and how they’re achieving success. But because start up costs are low for handmade businesses and most don’t require a loan, they don’t go through the mandatory steps a bank requires to ensure their business idea has a high probability of success. Look to shops around you; who’s selling a similar item (or a non-competitive item, as mentioned above) and seems to be doing well. Look at the differences between your shop and another’s and get ideas on where you can improve. Etsy is a great platform to use since you’re able to see how many sales a shop has had since they’ve joined. A “good” sales number depends on many different factors such as price points and how much time a seller dedicates to their business. 1000 sales per year may be a good guideline for success (depending on your industry and product) and is generally a healthy number of sales in a year for a handmade business. You may also visit websites. You’re unable to tell how well a business is doing from their website, but you may be familiar with the business and know they rely on it as their only source of income. Pull your shop, website or products and compare to the shop or website of a business you deem successful. Selection – how many types of products do they offer compared to you? Theme – do all of their products follow a certain theme when it comes to materials, colors, style, etc.? Photography – do their photos look professional? Prices – are their prices much higher or lower than yours? Quality – look at detail photos and determine if their products look finished and polished. Do they use a higher or lower quality of material compared to you? Read their reviews; are customers happy when their items arrive or are they stating they thought it would be bigger, a different color or better quality? Brand – what’s their brand like? If their logo looks modern and sophisticated do their bio, photos, product names, etc. also feel modern and sophisticated? What do they post and what type of interaction do they get? How do they interact with people in comments? Do they have a newsletter set up? Have they been featured in the press? Where have they been covered and what are the story lines? Which sales channels do they use? Are they selling at craft shows? Do they have an Etsy shop? What are they doing differently than you on each platform? Do they offer “free” shipping, discount codes or fast turnaround times? Read the reviews; what are customers raving about? Have they posted pictures of their craft show booth on social media? How many events do they participate in and what’s their display like? What does their website look like? Is it easy to navigate, put items in a shopping cart and checkout? Once you gather feedback and complete your research, make a long list of all the things you think you could do to improve. Again, you’re not copying another business’ model or setup. You’re simply looking for differences and then coming up with your own ideas that fit your business. Once you have ideas on how you can change your products, marketing and selling, it’s time to test. Choose one or two aspects to change, test them and see what the response is. If you overhaul all your products, your Facebook page and website, you’re not going to know what’s responsible for improvements. Or worse yet, if sales get worse, you won’t know what to simply set back to how it was. Pay very close attention to numbers. How much interaction did the new photo you posted to Facebook get? How many visits did a listing receive? How many sales do you have each month and how are they broken down by product? Don’t form opinions too quickly. Give each change a fair chance. You can’t try something once and decide whether it worked or not. You must be consistent and play around with small changes until you’re certain you found the right way. For example, if you try posting something new to Facebook and don’t get a response, don’t write the method off. Try posting something similar on a different day of the week and at a different time. On the other hand, if you put a new product out there and it sells right away, don’t be quick to assume it’s the answer to your problems and scrap all other products. You may have gotten a lucky break. Make another one and see if it sells again. You must see the same results at least a few times in order to label it as “successful” or “unsuccessful”. This process takes time and you likely won’t see sales turn around overnight. Of course businesses can be above 1 – 2% but that’s the average. Check in on your numbers; you’re likely doing better than you think you are. 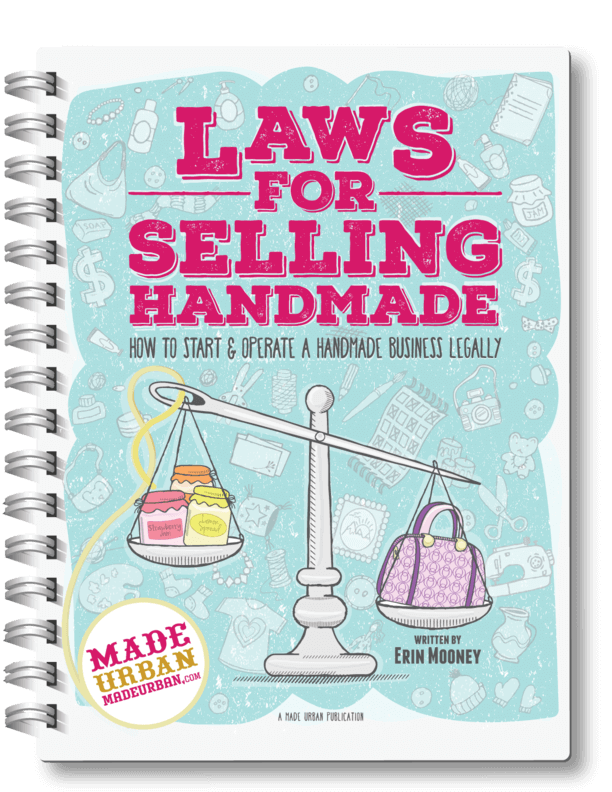 If you’d like more guidance on getting sales beyond friends and family, check out my ebook HOW TO SELL HANDMADE BEYOND FRIENDS & FAMILY. Are you making any changes to your business or products this year to sell more stock? Share your ideas or ask questions in the comment section! Do you have any suggestions for when you know you should probably streamline your brand./themes, but you still have leftover stock from before you gained all this wisdom from Made Urban? Is there a way to sell off “old stock” or stuff that doesn’t “match”? What I’ve done in that situation is advertise a “Sample Sale”. People are always attracted to a sale and I find that calling it a sample sale doesn’t devalue the merchandise. Another idea is to advertise – For a Limited Time. That type of advertising instills a sense of urgency. My products are different than the handmade products I see. I haven’t seen anyone selling the jewelry I make from paper or the small art paintings at any live shows. I like doing the live shows over online. Do you have suggestions for me? Thanks so much for consuming all the wisdom from Made Urban 😉 I think that’s a great idea suggested by Judy, you can always run a promotion and slightly discount your off-brand products to help move them faster. If you’re not keen on discounting, you can still create a bit of urgency by placing them in a category of their own in your Etsy shop/website or in their own (small) section of a craft show table, and label them as “last chance” (or something along that line) to let people know once they’re gone, you won’t be making anymore and to also separate them from your new products. 2) If it was an item that had been hanging around a little too long, it would be placed with similar products but at the back of the rack. It could still be shopped by customers but didn’t throw off the look of the fresh new collections. 3) It was marked down and again, downplayed by placing it in less visible areas like the bottom portion of a rack or wall, or at the back of the store. Thanks for reading! Did you have a specific area you’re looking for suggestions on? My blog, ebooks and email challenges are full of my advice based on different business areas.